Covering processes from product marketing and promotions to procurement, Stratus significantly increases an organisation's responsiveness and reach. 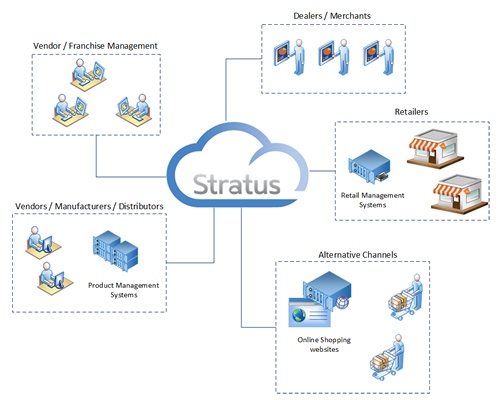 Our Cloud Commerce Platform solution, Stratus, is a cloud-based service of components that enable, simplify and promote the collaborative trading relationships between manufacturers, vendors & suppliers and retailers & merchants. Covering processes from product marketing and promotions to procurement, Stratus significantly increases an organisation’s responsiveness and reach. Manufacturers are releasing new products on a more and more frequent basis, in the main due to increased consumer demand for innovation. Add to this the increasing demand from retailers and merchants for consistent, compelling and accurate product and brand messaging across the different channels (omni-channel) and it is clear that the product information demand chain is becoming increasingly complex. All this adds up to huge pressure on the manufacturers to provide timely, accurate and high-quality digital content for their products, consisting of images and video as well as product data such as features and benefits, specifications and dimensions. The Central Procurement Platform delivers a central order management capability for retailers that benefits both the retailer and the vendor. Stratus delivers genuine benefits quickly and without the need for lengthy installations and implementations.